Women’s History Salon series "A discussion of women in journalism in the 21st century." Irin Carmon and Joy-Ann Reid - November 28, 2017. Guided by its committee of expert scholars, the Center for Women’s History presents a full calendar of public events. Join us for exciting programs and intimate conversations with scholars, journalists, artists, writers, businesswomen, and more amazing leaders of today. Lead support for the Center for Women's History programs provided by Joyce B. Cowin, Diane and Adam E Max, Jean Margo Reid, and the Andrew W. Mellon Foundation. In honor of Women’s History Month—and the anniversary of the Triangle Shirtwaist Factory Fire on March 25, 1911—the Center for Women’s History welcomes scholars Alice Kessler-Harris, Margaret M. Chin, and Janette Gayle to discuss the ILGWU’s impact on the labor movement and women’s movements, moderated by New-York Historical’s Nick Juravich. Join Marjorie Spruill, historian of woman suffrage, and Judaline Cassidy, tradeswoman activist, in conversation with Lynn Sherr, award-winning broadcaster and author, as they consider the women’s movement from the 19th- and early 20th-centuries and the long journey towards full equality. The washboard assemblages of Betye Saar—currently on view in our exhibition Betye Saar: Keepin' It Clean—feature several recurring themes and images from African American history. Among these is the iconic print of the slave ship Brookes, first circulated by British abolitionists in 1788 and now recognized worldwide as symbol of the barbaric reality of slavery. Join historian Nina Harkrader for a discussion of "all the single ladies" who bravely forged new paths for women in early 20th-century New York City. We'll explore the women-only homes designed to offer "good moral surroundings" for young ladies, the hotels that provided independence and ladylike comforts for “business women,” and a taste of what it might have been like to make one's way through New York City in the heady, early years of the 1900s. Inspired by the Big Band Era of Jazz, Dandy Wellington and His Band have taken the sounds of the 1930s and ‘40s and created a world of well-dressed music. The program will feature the songs associated with women who have contributed incredible music, perspective, and performances to Jazz and the black American experience. Two of America's most important feminist voices have written books grappling with the power of women's anger. Brittney Cooper's Eloquent Rage: A Black Feminist Discovers Her Superpower and Rebecca Traister's Good and Mad: The Revolutionary Power of Women's Anger take women's fury seriously as a political response and force for change. They place women's rage in historical context, and show how such anger has been trivialized or weaponized to undermine women. Join us for a lively conversation as Cooper and Traister discuss women's anger with New York magazine senior correspondent and CNN contributor Irin Carmon. In November, the Center for Women's History opened Betye Saar: Keepin' It Clean in the Joyce B. Cowin Women's History Gallery amid a remarkable outpouring of black women's creative labor in New York City. Meanwhile, also on view at New-York Historical, Black Citizenship in the Age of Jim Crow tells many of the historical stories that Saar's artwork interrogates. At the Brooklyn Museum, Soul of a Nation: Art in the Age of Black Power features Saar's work alongside that of her contemporaries in the Black Arts Movement. And at Columbia's Wallach gallery, Posing Modernity: The Black Model from Manet to Matisse to Today explores the changing modes of representation of the black figure as central to the development of modern art. How do scholars uncover the history of New York City? In the 1890s, a few intrepid individuals left the library and started digging. William Calver, Reginald Pelham Bolton, and their colleagues were among the first to explore New York’s archaeological record, excavating native villages and Revolutionary War encampments. Join Dr. William J. Parry, professor of anthropology at Hunter College, and Dr. Joan H. Geismar, PANYC president, join Dr. Valerie Paley, vice president and chief historian and director of the Center for Women's History, for a conversation on the legacy of the the Field Exploration Committee (FEC), which profoundly shaped the practice of urban archaeology. How did New York women manage their reproductive health in the 19th century? They could seek out patent medicines promising “relief” for everything from crying children to pregnancy itself—but who knew what was inside these bottles? Abortion was outlawed in the middle of the century, but some women doctors and midwives dared to provide it, including Ann Trow Lohman (AKA Madame Restell), whom authorities labeled the “wickedest woman” in New York. What can this history teach us about the importance of equitable access to reproductive health today? Join playwright Jessica Bashline, author of Wickedest Woman, and Dr. Ana Cepin of Physicians for Reproductive Health, in conversation with curator Sarah Gordon of the Center for Women’s History for a discussion on reproductive health in New York City, past and present. How did the city’s restaurants evolve from eating dens to dining establishments—and from fads to fabulous? Chef Angie Mar, restaurant critic Mimi Sheraton, and former Food and Wine editor Dana Cowin join us for a robust conversation about New York restaurants—then and now—and discuss their unlikely friendship and lessons about amazing food. Angie Mar is the lauded chef of the Beatrice Inn, the edgy, underground Greenwich Village chophouse and former Prohibition-era speakeasy. Award-winning author and legendary food columnist Mimi Sheraton was the first female restaurant critic for the New York Times in the 1970s and ‘80s. Moderator Dana Cowin, former long-time editor-in-chief of Food and Wine magazine, is the chief creative officer at Chefs Club International and the creative mind behind the food radio program, Speaking Broadly. Everyone on the planet—with few exceptions—wears something to protect the skin of the foot from the crust of the earth. Yet the humble shoe also can be an object of desire, display, and deliberation. In conjunction with our exhibition Walk This Way: Footwear from the Stuart Weitzman Collection of Historic Shoes, designer Stuart Weitzman and philanthropist Jane Gershon Weitzman discuss what shoes can mean and how they as a couple came to amass a substantial historic collection. Using his camera as a notebook, legendary New York Times style photographer Bill Cunningham (1929–2016) became one of the most influential authorities of style and society of his time. With the scrutiny of an anthropologist in the field, he let the streets “speak” to him as he gathered visual data on how fashions mirrored the times. For years, John Kurdewan, Cunningham’s long-time collaborator and friend, crafted the photographer’s images into iconic layouts for the newspaper, while the Times’ Style section editor and writer Joanna Nikas edited the popular “On the Street” videos, which featured Bill’s inimitable voice. Join them in conversation with Center for Women's History director Valerie Paley as they share anecdotes about the beloved photographer’s process and vision. Join us for a riveting discussion from two of current media's most enthralling (and entertaining) minds. Emmy-winning journalist and comedian Samantha Bee joins author and journalist Irin Carmon to discuss women, politics, and the media today. Samantha Bee is the host of the weekly late night Emmy-winning comedy series Full Frontal with Samantha Bee. Irin Carmon is a journalist and author of Notorious RBG: The Life and Times of Ruth Bader Ginsburg. Professional advice-givers have been answering Americans' thorniest, most intimate questions since before the nation was founded. Women came to prominence in the field partly in reaction to the emotional conservatism of the 19th century. Apart from giving advice, they were also generous purveyors of either empathy or encouragement—and sometimes both. In conversation with Center for Women's History Director Valerie Paley, Jessica Weisberg discusses her new book, Asking for a Friend: Three Centuries of Advice on Life, Love, Money, and Other Burning Questions from a Nation Obsessed, with Center for Women’s History director Valerie Paley. 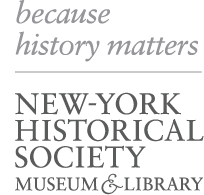 ​Biographer and journalist Susan Hertog joins us at the Museum for a conversation with New-York Historical Society President & CEO​ Louise Mirrer, Ph.D., about entrepreneur and philanthropist Evelyn Lauder, the Breast Cancer Research Foundation, and ​​The War Against Breast Cancer​.​ Refreshments will be served. How did art promote women’s rights at the turn of the 20th century? Join us as historian and printmaker Carole Turbin, historian April F. Masten—author of Art Work: Women Artists and Democracy in Mid-Nineteenth Century New York—and curator Sarah Gordon discuss the role of art in the fight for suffrage. We’ll journey together on a casual walk through our Hotbed exhibition to explore activism and the influence of the Greenwich Village bohemian scene on the New York suffrage movement as well as how activists used visuals to seek social and political change. Central Park currently boasts 23 statues of men. Conspicuously absent among them are portrayals of real women. Michele H. Bogart, professor of American visual culture studies at Stony Brook University, and Pam Elam, president of the Elizabeth Cady Stanton and Susan B. Anthony Statue Fund discuss the recent initiative to bring depictions of women's right's pioneers Elizabeth Cady Stanton and Susan B. Anthony into the park and into the larger conversation. Leading scholars and Center for Women’s History Advisory Board members Blanche Wiesen Cook and Lara Vapnek talk with Hotbed curators Sarah Gordon and Joanna Scutts about how bohemian Greenwich Village incubated women's activism in early 20th-century New York. Before the discussion, join us for a curator-led tour of the exhibition. Join Joy-Ann Reid, MSNBC host and national correspondent, and Irin Carmon, journalist, commentator, and author of Notorious RBG: The Life and Times of Ruth Bader Ginsburg, for a conversation on women in journalism in the 21st Century.